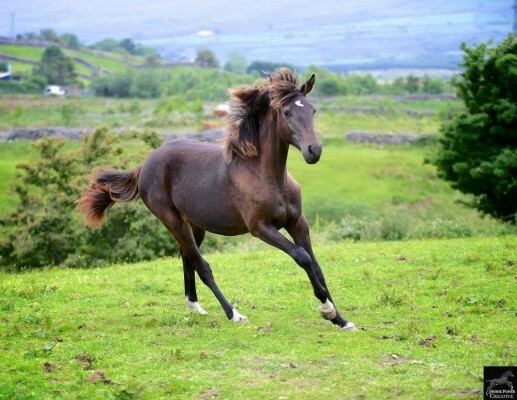 Fia Selene is a striking and utterly gorgeous rising 3yrs filly that ticks a lot of boxes, having inherited her sire's easy temperament that promises great rideability and trainability. This modern, elegant stallion needs no introduction. He combines the blood of the influential Furst Heinrich with some of the very best show jumping breeding on Accord II on the mother, and behind that a fantastic Hanoverian dam line and the important stallion Drosselklang. He is known for passing on wonderful quality and temperament. Now competing at PSG level. Dam - Tredethy by the famous Fleetwater Opposition, some wonderful Trakehner lines, behind that we have some Irish Sports horse lines including King of Diamonds. Tredethy was purposely bred for eventing, she is half sister to 3 star eventer Treloar and 4 star Badminton competitor Trebetherick. She is full sister to Treblare 3 star. She is going to be tall and convinces with a large yet harmonious frame. All that with a lovely type and striking colour that will make her stand out in competition. This lovely girl has no vices, easy to do in everyway . Loads and travels perfectly. Fantastic stable manners and is turned out with other horses. She is registered with AES, she is purple paered, three stars (top scoring) in her grading. She will make a fantastic all rounder and would suit a tall amateur or professional rider. FULLY VACCINATED UP TO DATE.